Keep up with the latest news about bumblebees, and all the everyday pollinators. We need the bumblebee. 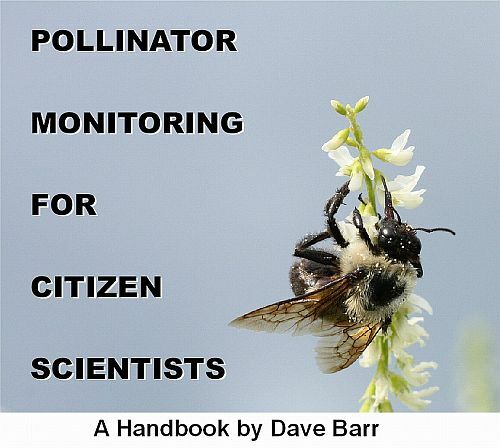 In addition to avoiding each other, emerging bumblebee queens need to be out and flying around when their favorite early food plants are blooming. Too early and it's too cool, with no nectar or pollen. Too late, and the blooming period is over, the preferred food all gone. How do they do it? How do they figure out when to emerge, especially underground, or buried in a rotten log, where the sun doesn't shine to let them know the days are getting longer? Bumblebees can apparently tell when to emerge the same way biologists can predict the dates for Spring plants to flower - they use growing degree days. Biologists have found that Spring flowers bloom after their buds have received enough heat. During the depths of winter, no bud development happens at all. But in late Winter and early Spring, the days start to get warmer. Every day the temperature is above approximately 50 degrees F, the flower bud grows and develops a bit more. Finally, when there have been enough hours warm enough for growth, development is complete and the blossom unfolds. We know it's accumulated warming that makes the difference, because if it was just the increasing daylength, Spring flowers would bloom on the same date each year. They don't. They bloom earlier in a warm Spring and later in a cool one. It turns out you can calculate the amount of heat a Spring flowering plant is receiving using a measure called degree days. You add up all the hours since January 1st that the air temperature has been above 50 degrees F and divide by 24 to get a measure called a growing degree day. But since we're interested in bumblebees, we'll call them bee degree days. You can read more about degree days and how to calculate them HERE and HERE. 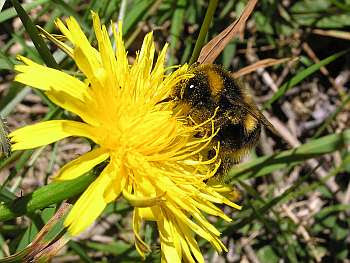 So if we, or the bumblebee, can keep track of the number of bee degree days, we can predict when the flowers will appear. Each species of flowering plant seems to have its own, unique required number of degree days for blossoming. Hibernating bumblebees, of course, do not use computers and trig functions to calculate bee degree days. In all likelihood, some aspect of their internal body chemistry changes slowly when the temperature is warm enough. After enough warm days, the chemistry has changed enough to wake up the slumbering queen. Soon she's on her way, in search of that first, quick pick-me-up of fresh Spring nectar. All content copyright (c) Innogenesis Inc. 2010. With the exception of images from the public domain, GNU or Creative Commons licenses, all rights reserved.